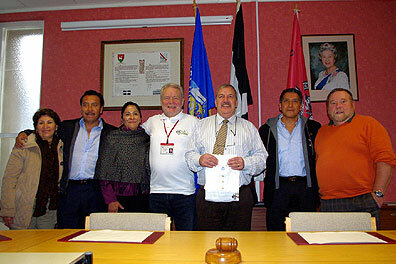 The Cornish Pasty Association (CPA) recently welcomed visitors from the Mexican group Consejo Regulador del Patrimonio Cultural Real del Monte Cornwall AC (The Regulatory Council for the Cornish Heritage of Real del Monte), led by its Chairman, Jaime Soto. The group is in the county on a fact finding mission ahead of the opening of the world’s first Pasty Museum in March 2012 in the town of Real del Monte, Hidalgo State, Mexico. Real del Monte holds the world’s only International Pasty Festival which took place for the third time in October this year attracting an estimated 20,000 visitors to this picturesque town. The historical links between Cornwall and Real del Monte date back to 1824 when Cornish mineworkers first settled in the area and helped to rebuild the mining industry in Mexico following the War of Independence. Today, Real del Monte is the home of pasty production in Mexico; the Mexican version of the product is called the paste and is made to a slightly modified recipe. Richard Williams, of Poldark Mine, who initially set up the historic social and cultural links between the two areas to encourage communication between the descendants of the Cornish families who lived in the state and who can now be found scattered across the world, is a member of the Consejo Regulador del Patrimonio Cultural Real del Monte Cornwall AC and hosted the visit. The group toured Cornwall for over a week, visiting various Cornish pasty makers, ranging from small bakeries to large manufacturers. The visit started with a meeting with Mark Muncey, chairman of the Cornish Pasty Association, at Poldark Mine. The fact finding tour also includes meetings with the Secretary of the Cornish Association of Tourist Attractions, the Mayor of Redruth and the Cornish Mining World Heritage Site Coordinator, as well as visits to both Crantock’s and Berrymans’ bakeries.